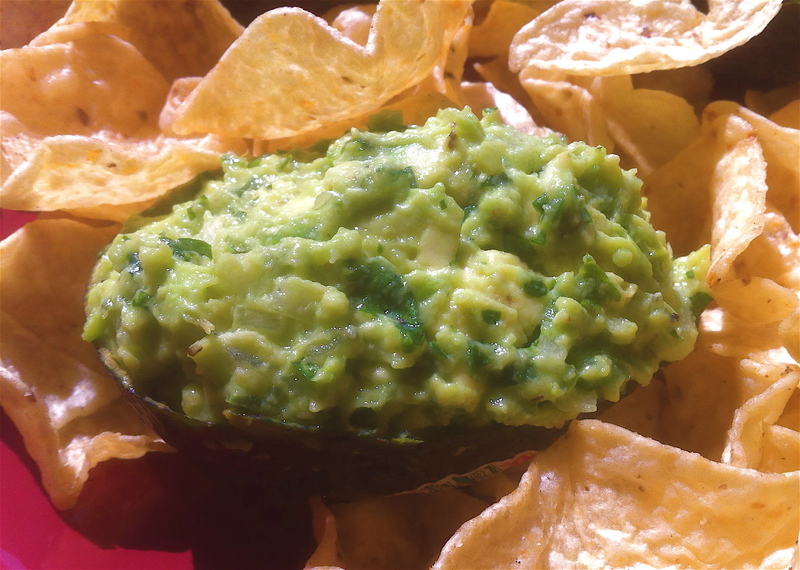 Of all the appetizers in my normal repertoire, guacamole is my favorite. Well actually, it’s my favorite that my sister makes. Everyone has “their things” around the house, and Calli is always in charge of the guac. Like most other things, she likes hers a little on the spicy side, but her recipe is mouth-watering. Creamy avocado, spicy jalapeno peppers, fresh cilantro, and zesty lime juice… all the perfect components for guacamole. You can make this as an appetizer with chips and fresh veggies or choose to serve it as a side dish to a Mexican entree like my mahi mahi fish tacos recipe. No matter which way you choose to serve it, you better take it fast! Your serving dish will be scraped clean in no time. Place the garlic, red onion, jalapeno, serrano, and cilantro in a small food processor. Pulse until all of the components are minced. Add to a medium-sized bowl. Cut the avocados around the middle with a good knife. Split in half and stab the pit with your knife to remove it. Use a spoon to scrape out the avocado from the skin and into the bowl. Immediately add the lime juice to the avocados to prevent browning. Use a potato masher to break down the avocados. I like my guacamole on the chunky side, but mash until all of the ingredients are incorporated and the texture you desire. Keep covered and chilled in the refrigerator until ready to serve. Serve with tortilla chips and mixed vegetables for dipping.